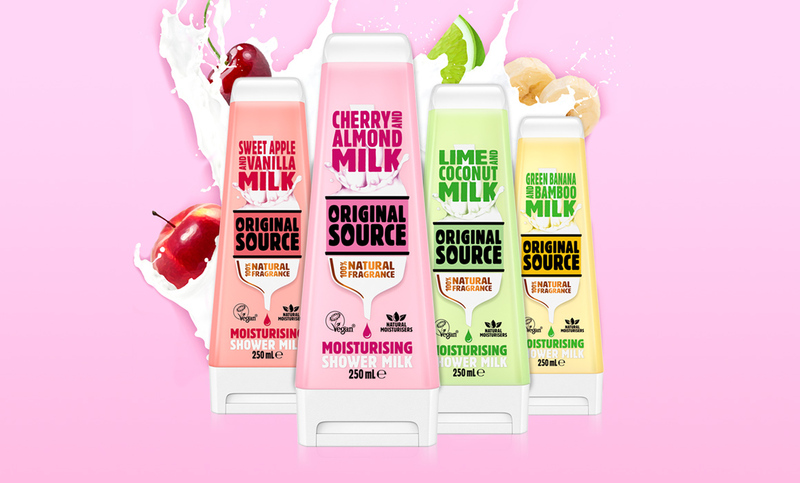 Original Source appointed Hark to launch a new range of moisturising Shower Milks that bring a fruity moisture boost to your morning routine. Packed with vegan milk extracts, natural moisturisers, and 100% natural fragrance, we needed to develop an identity that would instantly communicate the milky, moisturising point of difference of the new range. Consumers expect Original Source products to deliver a sensorial hit through the power of nature, now with a fruity moisture boost. We worked closely with PZ Cussons to develop an identity that would instantly communicate the milky, moisturising point of difference of the new range. We also turned the iconic black funnel device and cap to white, instantly differentiating against the existing core range on shelf.